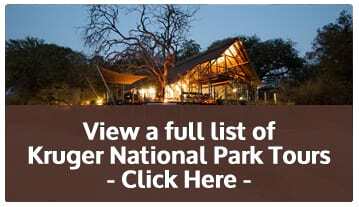 The 5-night/6-day Kruger safari tour offers guests a budget-friendly trip to South Africa’s most popular safari destinations where a real African experience doesn’t have to come with a hefty price tag. Guests stay in comfortable accommodation in a beautiful bushveld setting at a game lodge situated close to the Greater Kruger National Park. The tour is a combination of guided sunrise bush walks, Big Five safari tours with a professional safari guide in an open safari vehicle and the opportunity to interact with injured and orphaned animals and birds of prey in the care of a wildlife rehabilitation centre. Evenings are spent under the stars enjoying an authentic African bushveld braai (barbeque). The 6-day Kruger safari ends with a tour of the Panorama Route which includes the world-renowned Blyde River Canyon and the Three Rondavels. Transfers to and from Johannesburg and Pretoria in an air-conditioned luxury Quantum. Travel in an air-conditioned luxury Quantum to Tremisana Game Lodge in the Balule Section of the Greater Kruger National Park. At 17h00, board a luxury Toyota Landcruiser open safari vehicle for a 4-hour sunset game drive. Enjoy an exciting night safari and return after dark. Dinner is served under the stars at the lodge lapa, situated deep in the bush. Enjoy an authentic bushveld braai (barbeque) and relax around a roaring fire lulled by the distant call of hyenas and lions. Early morning wake-up for tea/coffee and rusks before setting off to the Olifants River for a 4-hour guided bush walk with an armed professional safari ranger. Learn more about the flora and fauna of the Kruger National Park while keeping an eye on the thick bush for the Big 5. Your private safari guide will teach you to identify wildlife tracks and spoor and you’ll tick off many of the Kruger’s birds. Return to Tremisana Game Lodge for a late breakfast and refreshments before departing after afternoon tea at 15h30 for an afternoon game drive in Balule Big Five Reserve. Return to Tremisana Game Lodge after an exciting night safari; dinner is served at the lodge lapa. Wake up early for a hearty breakfast. Enjoy the early-morning sound of the bushveld and birds waking up. Freshen up with a dip in the pool or relax on the lodge patio before it’s time to depart to Orpen Gate for a full-day Kruger safari in the Orpen-Satar-Nwanedzi region of the central-western belt of the Kruger National Park in an open safari vehicle; sightseeing, game viewing and bird watching with a mid-day break for lunch at a popular Kruger National Park rest camp. Return to Tremisana Game Lodge as the sun sets low over the spectacular private game lodge. Dinner is served at the lodge lapa. After breakfast, enjoy a leisurely drive to Moholoholo Wildlife Rehabilitation Centre; located at the base of the majestic ‘Mariepskop’ mountain range in Hoedspruit. Interact with the injured and orphaned wildlife ambassadors and learn more about the incredible conservation efforts of the Moholoholo team. Return to Tremisana Game Lodge for lunch; relax and freshen up before it’s time to depart at 15h30 for a 3-hour afternoon game drive at Tshukudu Game Reserve. This is a Big Five game reserve so be on the lookout for lion, rhino, buffalo, elephant and leopard. Return to Tremisana Game Lodge after a successful night safari for a much-needed drink and a delicious meal at the lodge lapa. Enjoy a second full-day Kruger safari; the region is known as having one of the highest concentrations of game. Return to Tremisana Game Lodge as the sun is setting; dinner is served at the lodge lapa. Wake up early and enjoy a sunrise game drive. After a hearty breakfast, your tour departs for Johannesburg taking the scenic road home via the spectacular Panorama Route which includes a stop to view the Three Rondavels and the Blyde River Canyon. Return to Johannesburg by 17h00; drop-off by arrangement at OR Tambo International Airport or any hotel/guest lodge in Johannesburg and Pretoria.